Rediff.com » Business » What are Modi's plans to stop future black money? What are Modi's plans to stop future black money? 'They must be secretly rejoicing that while Modi is taking away their past, he has not shut the door on their future,' says banker S Muralidharan. The world is fretting over Donald Trump winning the mandate to lead the US for the next four years. But we Indians are preoccupied with an issue that is much more local. To paraphrase a well-worn saying, 'local' is all politics. So is the sudden demonetisation of high denomination currency notes. Demonetisation is the act of a government declaring that a currency or some of its components are no longer legal tender. As a consequence the citizens can no longer exchange it for anything of value. On the face of it this can be draconian since the poor have no assets other than a few rupees to fall back on. What do they do if those rupees are declared worthless? The rich have many other assets to fall back on. They do not live a hand-to-mouth day-to-day existence. Demonetisation, as with inflation, recession, stagnation, unemployment etc, affects the poor disproportionately. So why would a country demonetise its currency? One reason could be to control rampant hyper-inflation, which affects the poor even more severely, as in Brazil of the 1980s. In the later part of that decade Brazil went through a veritable cavalcade of currencies, Cruzeiro, Cruzado, Cruzo, ending with the Real -- I forget the exact order of their appearance and equally regular disappearance. I believe there was even a New Real which has since become just the Real. Quite unreal if you ask me. Although our own inflation is nowhere near as alarming, continued populism can easily make it so. Populism rules in a federal set-up like ours where national parties and national issues are becoming increasingly irrelevant. Remember all politics is local. It is also worth remembering that inflation is an extra tax that the poor pay and therefore its control should be at the heart of economic policy of a country where over 35 per cent are below poverty line. 1. Black money which he had promised to control is nowhere near control. 2. Rumours have been circulating about our neighbours assiduously trying to wreck our economy by flooding it with fake currency. War by other means. 3. Looming elections in Uttar Pradesh. Let's take black money first. But why should we concern ourselves with black money in inflation control? By definition black money is the money beyond the government's control and is impervious to the monetary and fiscal regulations to control and direct the economy one way or the other. Imagine a vehicle whose steering is being controlled by someone outside of it: Whatever the driver does, it goes where the 'real controller' takes it. Would you travel in it? If not, why would you live in a country whose financial control is not fully in the hands of its government? In order for the government to effectively control inflation and prices, interest rates, supply of essentials, it needs to identify, reduce and eliminate black money. Would you object to the government trying to get full control over its economy? Black money has two components. One is the amount already generated and lying in the form of assets (real estate and gold) or simply as currency (stock). Two different type of efforts are required to eliminate the 'stock' and 'flow' of black money. We can attempt to eliminate the 'stock' as of a given date. Those measures alone will not succeed in stopping the future 'flow'. What Narendra Modi has announced will only tackle the stock as on date, but will do nothing to dry the springs whence black money flows. The only valid criticism I have heard is P Chidambaram's dig that Modi has done nothing to stop the future 'flow' of black money. Absolutely right. Hopefully Modi has some other plans up his sleeve. One form in which black money is stashed in India is gold jewellery. This also fits in with our cultural predisposition to use gold as a means of saving and to gift gold to our daughters at their weddings and at various other life stages. Fearing massive backlash, successive governments have shied away from questioning our gold holdings and additions thereto. This loophole has been mercilessly exploited by the less scrupulous to amass gold in the form of jewellery. When caught they explain it away as wedding gifts or as family heirlooms. The government's gold deposit scheme ostensibly was to put 'idle' gold with the public to useful economic work. I suspect that the real reason was to identify large chunks of gold holdings which was likely to be money that evaded the tax net or even of criminal origin. Smartly sensing that the deposits can be traced back to the owners of the gold, those who had their concealed/ill-gotten wealth in gold politely declined the offer. You don't get to be rich by being stupid. Suffice it to say that they saw through the game and gave it their thumbs down. Volume-wise, gold is easy to stash, albeit a risky asset to hold. Real estate is not so easy to hide, especially from today's technologies like GPS and GIS. But for some reason our governments have been reluctant to use these technologies to trace the properties and their owners. Perhaps because while income tax is a central subject, land registration records are within the purview of the states. Guess who has been stashing their black wealth in real estate? Modi drew a blank again. So the only option available to Modi was to have a go at the cash component of black money. What kind of numbers are we talking about? 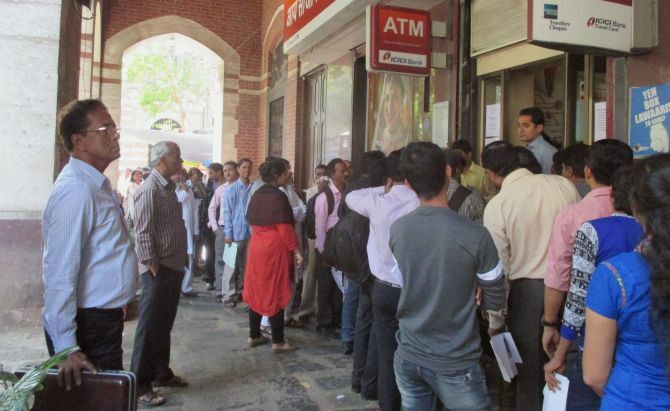 It is estimated that cash in circulation is around Rs 13 lakh crore. That is 13 followed by 12 zeros (about $200 billion). That is 10 per cent of our GDP. That is bigger than the GDP of all but 48 countries in the world. It is said that rural India deals only in cash and that most of this 13 lakh crores comprises of rural transactions. Not so quick my friends: Only 14 per cent of this 13 lakh crores is in denominations of Rs 100 and below. If you believed that rural Indians casually saunter around with 500s and 1,000s in their pocket, that should be a situation devoutly to be wished -- there won't be many poor then, would there? The component that is stashed outside India in tax havens and such like places is beyond our reach. While they force us to apply rigorous KYC norms even to financial inclusion bank accounts with teeny weeny balances, ostensibly to deter terror funding, Western countries are reluctant to hand over economic offenders and or their financial details. The same people who argue that terrorists are using a large number of small accounts to collect cash are unwilling to hand over details of small number of large accounts. So much for Modi bringing back the Swiss or Panama money. Don't hold your breath; it is not coming back. The only component of black money over which the government has a modicum of control is that which is right here in the form of cash. Which also happens to be mostly held in the form of high denomination notes. In 2000, 80 per cent of cash in circulation was in notes of denomination 100 and below. By 2014 the ratio had shifted from 80/20 to 20/80. Under the United Progressive Alliance government there has been a steady conversion to higher denomination notes, most likely for the purposes of hoarding black money. The alternative explanation, that people needed Rs 500 or bigger notes to pay for the same goods and services they could procure with Rs 100 notes earlier, is even less flattering to the UPA dispensation. The fastest growth came in Rs 1,000 notes. Even an urban upper middle class tax-payer like me hardly ever sees, let alone use, a Rs 1,000 note; the rural poor cannot afford it. Clearly those notes are being used mainly for transactions below the tax net. So much for shrill protests of the loony left and myopic Mamata Banerjee. The government has not completely shut the door on old currency notes. It has given 45 days time for the old notes to be exchanged for new. Exchange will happen at banks and post offices. Banks are scrambling to accept all comers. I suspect that records will be kept of those who surrender large amounts of demonetised notes or make large number of smaller transactions. These will be examined by tax authorities and unexplained ones treated as black money and accordingly dealt with. The cash kept for use in elections will obviously get stuck in no man's land, which is why the most vociferous objections are from political circles. In 1978, when Morarji Desai announced his demonetisation there was nary a flutter. Information was probably leaked to the intended targets before the tax men descended on them. There simply wasn't this much of black money to worry too much about it. To pre-judge the success or failure of the present scheme by the failure of the past ones is to say a baby must not learn to walk because it had fallen earlier. The earlier attempts at demonetisation likely failed because of the inability to link multiple accounts of the same individuals and lack of a reliable identity. Now the core banking systems of the banks, Aadhar ID, PAN number and KYC have combined to make mass evasion near impossible except with the wilful collusion by officialdom. There will be a few who can still escape, ably advised by amoral accountants and colluding corrupt tax officials, but they will find a way no matter what. Why are the political parties screaming bloody murder to anyone who will listen? The most noise comes from Uttar Pradesh: From Mulayam Singh Yadav and his henchmen and Mayawati. The answer is elections. I think Modi did what he did at the time he did it is because of the UP elections. Everyone knows that elections are one of the principal uses of black money and that winning the election puts you in a position to generate more. Black money, elections and politicians form an eternal triangle which must be broken if we wish to have better governance. The arguments from UP range from the utterly predictable ('anti-poor') to the comprehensively insane (old notes must be allowed as 'wedding gifts' -- UP Chief Minister Akhilesh Yadav). The one whose party collections are entirely in cash and who has a penchant for garlands of Rs 1,000 notes was seen on television reading from notes about the hare-brained-ness of the scheme. Is it? As for the Congress and the Aam Aadmi Party, they don't even bother with facts any more. How about the accusation by all and sundry that the measure affects the poorest most? Would you rather that the poor endure the long, slow misery of seeing their purchasing power erode away each day rather than try something that while affecting them for a few days has a good chance to make their life better in the long run? More importantly, is it not worth giving India a shot at cutting the political money and mafia to size in one fell swoop? What about the 'flows' that I talked about? Alas, in this scheme there is nothing to stop the black money flows of the future. On the contrary, I think Modi has sown the seeds of more, through the issue of Rs 2,000 notes. If there is a weakness in this scheme, this is it. But have you heard one single politician decrying this aspect of the scheme? Even as they are crying seeing their vote machines turn into toilet paper, they must be secretly rejoicing that while Modi is taking away their past, he has not shut the door on their future. The reason black money was being generated in the 1970s was the the so-called 'confiscatory' rates of taxation, in some cases near 100 per cent, that existed then. That is an old story. Corporate and personal taxes are very reasonable now and have been for a couple of decades. But the same decades correspond with the tremendous rise in overseas hoarding of wealth. If confiscatory tax rates were the stimulus for tax evasion, why has abandoning them not reduced black money generation? The answer is to be found in the tremendous rise of political corruption and blatant buying of votes with scant effort to conceal it. The ways to tackle political corruption is through eliminating opportunities for rent-seeking by the politicians and the bureaucracy. Despite the so-called liberalisation, it is said that an enterprise still needs over 40 permits and licenses to commence business. Suffice it to say that the government of the day must think hard and long and get everyone on board concerning dismantling of these rent-seeking controls which feed black money into the political system. Finally, the aspect no one -- absolutely no one -- is talking about is the attempts at destabilising India through flooding the economy with fake currencies. It has historical precedence: The Allies tried to wreck the German economy during World War II through a fake currency mechanism. Our own neighbours are known to be trying every trick in the book and then some not in the books. The unholy alliance between China and Pakistan and its objectives vis-a-vis India are well known. It is the cost-effective way of waging the most effective war with India. Bleeding India through a thousand cuts is a stated Pakistani policy and China can gain immensely through Balkanising India. Fake currency can effectively fund inserted as well as home-grown terrorism. An impaired economy will lead to political fragmentation and depending on the extent of impairment, possibly Balkanisation. If that happens, China scores one for its friend and one for itself. In the final analysis, this demonetisation is not the great Brahmastra that will once and for all decimate the cursed black money as the Bharatiya Janata Party wants us to believe. Nor is it a perverse action of a mad man indifferent to the suffering of the poor and born of political peeve that the Opposition would have us believe. The shrillness and the stridency of opposition is a measure of how steeped in black money they all are and how dependent on it for political survival. It is an act that was long overdue and which had better work for us to have a decent chance at progress. All in all, this demonetisation is the last throw of dice by one who is running out of options. Modi is playing the only card that he has left. As the incumbent PM he gets to choose the timing and he has chosen a time that suits his opponents the least. S Muralidharan retired as the managing director of BNP Paribas after serving the bank for 20 years. He began his banking career at the State Bank of India and worked at SBI for 12 years. 10 pics of India that speak a million words! Will demonetisation lead to a windfall?